In the 2010 World Championship match, Vishy Anand went into the final game deadlocked with Veselin Topalov. It seemed as if the best he could hope for was a tie and a playoff… but then he unexpectedly ended the match with a stirring victory as Black! I predict that we will see the Grunfeld Defense again and will see a new attempt by White to present a surprise at an early stage, far from the most topical variations. But of course, Gelfand will expect exactly this. So… anything is possible! Let’s just watch and cheer. May the best man win. As it turns out, the world champion’s camp was not able to find a refutation of the Grunfeld Defense. Peter Svidler can be satisfied. The Sicilian Defense has served Gelfand well for his whole career and in particular in this match. Again the Rossolimo Variation, as in the tenth game. Position after 5. d3. Black to move. A flexible strategy in the spirit of Philidor’s philosophy. 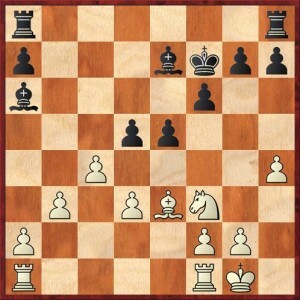 Black’s central pawns, including the one on f7, can move forward, depending on what White does. It’s very important not to allow a complete blockade of the center and to give the bishops some room to operate. 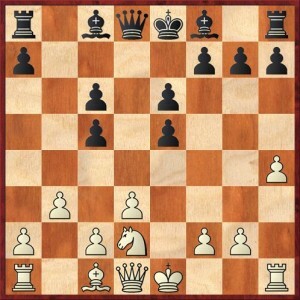 For example, with the pawn on d7 Black is prepared to meet the advance e4-e5 with the disrupting … f7-f6. A principled objection, and it would seem, a pawn sacrifice. Position after 10. Nd2. Black to move. Black has snagged an extra pawn, but White has a lasting initiative. He has prospects of winning back the pawn on c5, but Boris is most likely more concerned with the activity of his opponent on the kingside. Notice how quickly Vishy is playing — he is still following his prepared variations. I will pronounce the first small, local victory for the champion’s forces — he has managed to get the jump on his opponent and force the challenger to work over the board at a very early stage. There is already no question of an early draw in today’s game, we can expect a serious battle! The clock shows 1:55 – 1:27. Gelfand cannot make up his mind. This is a very unpleasant moment for him. Black has no obvious counterplay, and it’s not even clear at the moment what threats he should be defending. And time pressure is lurking in the distance… I suspect that the Israeli grandmaster is looking for some kind of cardinal decision, some way of radically changing the position, to confuse his opponent. It’s possible that he is considering the return pawn sacrifices … c5-c4 or … e5-e4, which give Black hope of reviving his passive bishop on c8. Position after 14. Nxe5. Black to move. 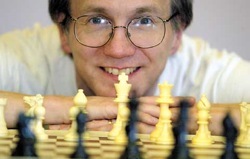 Black has repaired his pawn structure. Now he must attack! Beautiful! Thep awn at c2 can now become the target of attack by Black’s rook, and if c2-c4 White must reckon with the shot … e5-e4, blowing up the center. Position after 18. Be3. Black to move. 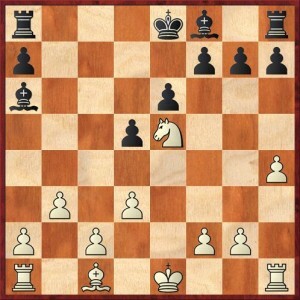 With this move the champion is trying to provoke the advance … d5-d4, which would stabilize the pawn structure. It’s unlikely that the challenger will accept the invitation… On the other hand, it’s worth pointing out the harmful effects of the move h2-h4 in this situation. Pawns don’t move backwards. 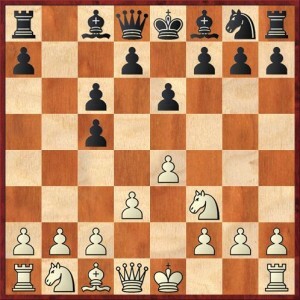 It’s possible that Black can create some complications on the kingside. The clocks read 0:59 – 0:40. Once again a strong move. Black’s white-squared bishop applies serious pressure on White’s position. If he can open even one rank on the right side of the board, White will be under attack. Another idea is to open the queenside with the moves … a7-a5-a4. It seems that Black has no reason to complain about his life. And what is White to do? Breaking in the center is dangerous, because the Black bishops would run rampant. Apparently he must try to activate the queenside, where he does after all have an extra pawn. … or organize the break … a5-a4. Position after 21. Bc5. Black to move. and here Anand somewhat unexpectedly OFFERED A DRAW, which Gelfand quickly accepted. 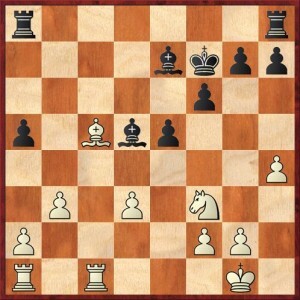 [22.Nd2 was no worse, in effect telling Black to go ahead and trade bishops on c5.] A possible continuation was 22…Kxe7 23.Nd2 a4 24.Rc7+ Kf8! 25.b4 a3! and Black’s counterplay is not bad. What can I say? It’s easy to understand the champion’s decision. One can’t say that playing for a win in the final position would be free of risk. Quite the opposite! The game just completed must be considered disappointing for Anand. In the opening he achieved a promising position and an hour time advantage — what more could you possibly want? Gelfand held himself together like a champion with a fine sense of psychology. He correctly returned the extra pawn, and then provoked his opponent, tempted him with another pawn sacrifice, seized the initiative and escaped with only a mild scare. And so, the regulation time of the match has ended. The score is tied, 6-6! Now we await a tiebreaker consisting of four games of rapid chess and an unlimited number of blitz games in case of a 2-2 tie. This feast of chess and trial of the opponents’ nerves will begin the day after tomorrow at 12:00 Moscow time, three hours earlier than usual. I will try to think about how I can comment on this event…Please send in your own suggestions, dear readers, to the KasparovChess forum [on the Crestbook website — DM]. This has been grandmaster Sergey Shipov with you. Thank you for your attention, and I’ll see you soon! Note to my readers (this is DM again): As you can see from the above, it remains uncertain whether GM Shipov will comment on the tiebreak. In any case, I will not translate his annotations, if they exist, because everything will happen in the dead of night California time. In any case, it’s hardly likely that there will be time for meaningful comments and translations during a rapid game, to say nothing of a 5-minute game (if the tiebreak gets that far). You should check at Chess in Translation to see if Colin McGourty (aka MishaNP) has any plans for translating the playoff. As a separate issue, I’m sure that anyone who has read this blog before knows that I think it’s a ridiculous idea to decide a world champion by blitz games. To me, it devalues the whole concept of a world champion. But in some sense it would be the logical culmination of this whole strange World Championship cycle, with a candidates’ tournament that was full of draws and rapid-chess playoffs, and a championship match that was just the same. Thanks again to all of you who read my translations. In spite of the need to get up early, I have had a lot of fun, and I hope you have, too! Thanks for all your work Dana! Next post: Anand Remains World Champion!